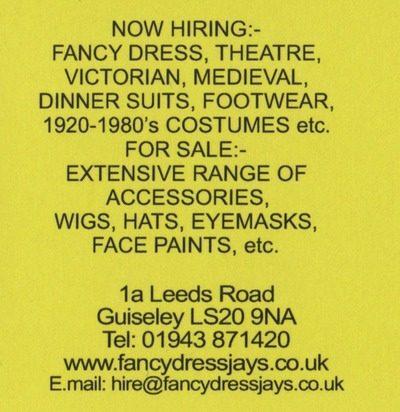 Jays Fancy Dress Hire started in 1995 and is a family run fancy dress business. We have a large range of hire costumes including Peaky Blinders, 1920s, Superheros and Game of Thrones etc. We also sell a huge range of accessories to compliment costumes. The price for hiring of the costumes varies but the general price is £20 - £25 to hire plus a deposit which is refundable on return of the costume. The price includes accessories such as beads and hats to complete the costume.